Garmin&apos;s new pilot head is as stylishly informative as its multifunction instruments. The 50-foot custom Wesmac Kathleen might have been a real autopilot challenge, what with her twin 585-hp Cummins MerCruiser QSM11 diesels powering brutish Hamilton HM422 waterjets and little below for directional stability beyond her chines and a couple of skegs. 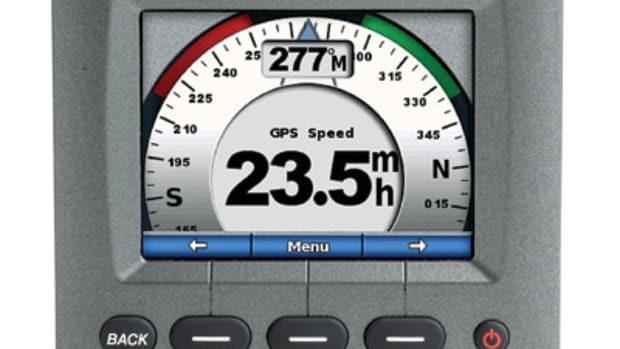 An earlier and smaller but otherwise similar yacht had such a sensitive helm that the same owner usually turned the steering duty over to a trusty Simrad AP20. But this time he&apos;d decided to try Nautamatic&apos;s TR-1 Gladiator system, largely because of the truly unique "Shadow Drive" feature that would let him disengage and re-engage the &apos;pilot without pushing buttons. 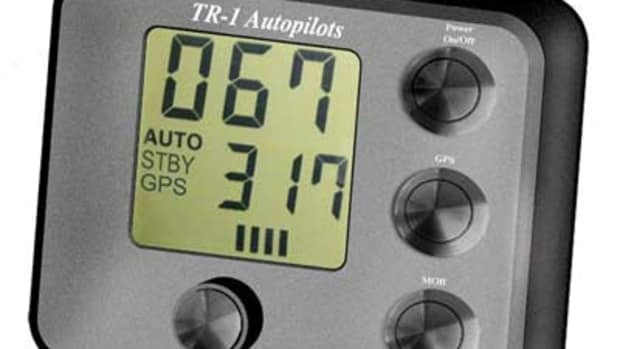 Then he lucked out, at least theoretically, when during the protracted build Garmin bought Nautamatic and offered, for the sake of beta testing, to replace the TR-1 with the next-generation GHP 10. 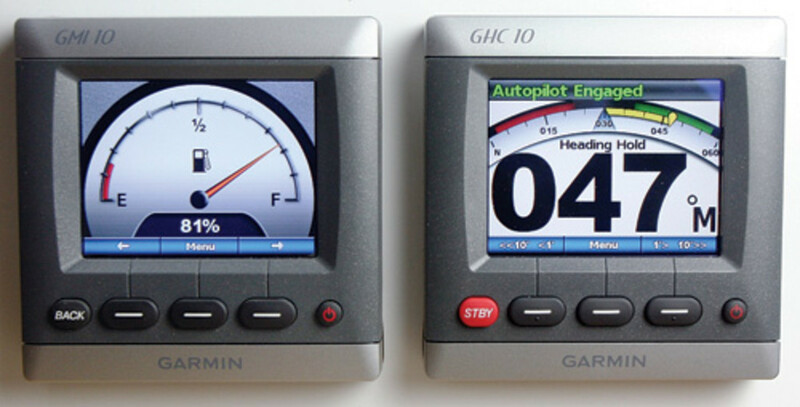 If it worked as promised, the owner would not only get a much improved control head, the GHC 10, but it would also nicely match and integrate with the twin 12-inch Garmin MFDs that he&apos;d already designed his helm around. I lucked out too, as Kathleen was built near where I live and thus I was onboard for that rubber-meets-the-road moment when the beta GHP was first commissioned and sea trialed. That was brave of Garmin, even with the testing hedge, but its confidence was well-founded. The major downside of the original TR-1 was a complex multibutton control with only obtuse LEDs, no display; merely activating advanced features was hard, and the many details of an install must have been a manual-always-open nightmare. The GHC-10 changes all that. John Neyland, Garmin&apos;s manager of OEM/NMEA Systems, activated the installer menu with a secret button combination, revealing clearly written system detail choices and even an install "wizard" which politely led us through underway compass-swinging and boat-analysis routines. The latter used the GHP&apos;s zig-zag pattern steering feature to learn Kathleen&apos;s steering habits, but the process didn&apos;t seem thorough to me. I was wrong. 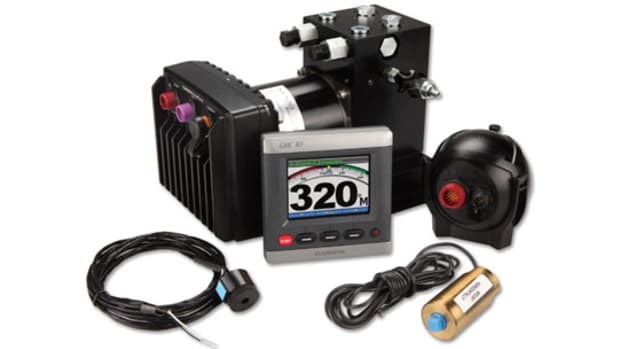 While making an autopilot installer&apos;s life easier is no doubt good for us boaters, the big concern is performance, and even the beta GHP delivered. After engaging the pilot at several speeds and watching it steer without a discernable degree of doubt—and note how the difference between actual and desired heading is boldly shown in yellow on the GHC (as seen above when changing course)—Neyland tried rapidly changing speed while still engaged, then going dead slow ahead with wind and wave at 45 degrees to the bow, and finally even threw one engine into neutral at 12 knots. No matter what, Kathleen held a course as straight as a missile track. 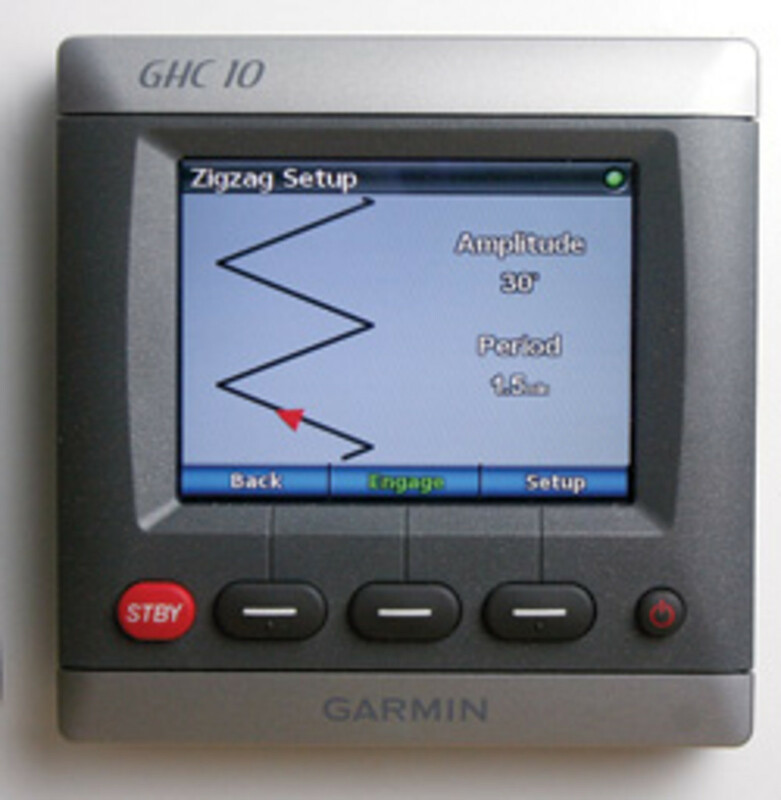 By the way, the real rocket scientist who developed the original TR-1 (see "Brains in the Bilge," February 2004) is now working for Garmin (and darn happy about it). This pilot can steer many different patterns useful for fishing, MOB situations, etc., and they are often easily customized. What the GHP wouldn&apos;t do that day was steer Kathleen in reverse, but that&apos;s a feature that no other autopilot even claims it can do. Besides, the GHC really was still in development, and the worst that happened was a beeped warning explaining that the unhappy hydraulic pump had disengaged. Unfortunately I won&apos;t get a follow-up trial on Kathleen before next season because unrelated circumstances required her to be hauled before Garmin finally declared the autopilot finished in October. "Our engineers, who also do aviation guidance and control, take this stuff very seriously," noted Neyland. But it happens that I know another GHP beta tester who&apos;s been using the system on a Krogen 44 since last March. 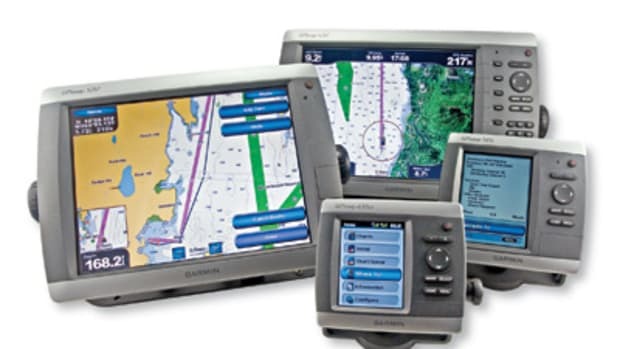 He reports that after several visits from the Garmin engineering team his boat will do every maneuver shown graphically, and often with customizable parameters, on the &apos;pilot&apos;s bright and fancy color screens. What&apos;s more, he&apos;s grown confident enough to let it steer the often narrow 183-turn channel between his dock and the part of Chesapeake Bay that&apos;s deep enough to relax in. In short, Garmin&apos;s autopilot, which starts at about $3,000 complete, looks to be a performance winner, but there&apos;s more to it than that. 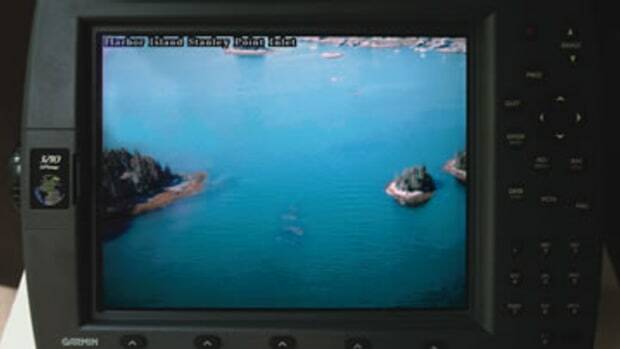 Behind the scenes it uses NMEA 2000 to communicate compass, steer-to, and command information between the GHP control module and the GHC head unit, and any number of Garmin 4000 or 5000 series MFDs, or other N2K gear. It&apos;s a big change from the original TR-1 that makes system installation easier and more reliable, and integration possibilities broader. But let me note, referring to my November Electronics column about tempering new system expectations, that the Garmin N2K MFDs could hardly use the port until almost a year after they were first shipped. No doubt there will be updates to the GHP/GHC, like perhaps a rudder-angle indicator—this auto-pilot, like the original, doesn&apos;t need a rudder sensor, but many skippers still want the information—and perhaps a simplification of the go-to-waypoint screen that may be slightly too fancy. 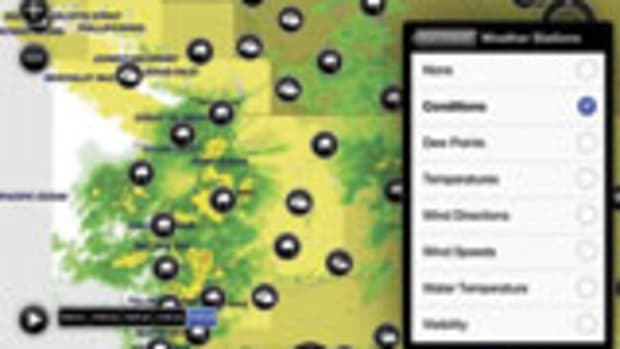 But, as noted, Garmin tested the core reliability of this autopilot extensively, and if there are glitches, it will be a professional installer who fixes them, which is the other noteworthy aspect of this product. Autopilots most definitely reside in the realm of technical dealers, the folks who not only sell marine electronics but make sure they work, and the same folks who sometimes mutter things about Garmin and "big box stores" in the same sour sentence. 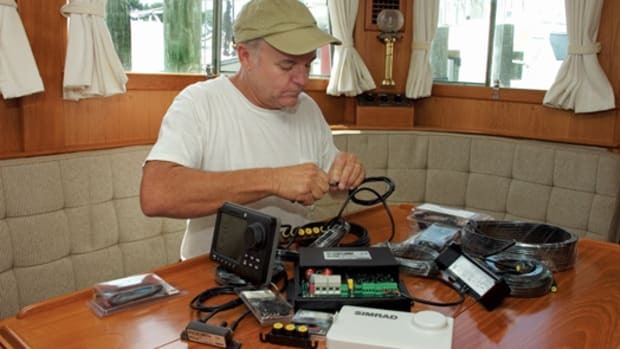 Garmin has approached this problem energetically, offering extended warranties for gear installed by NMEA-certified pros, installer rebates, and the expert attention of Neyland, once a New Jersey dealer/installer himself, and his team. It was a July Saturday afternoon boatyard meeting with Neyland that truly impressed me in this regard. I found him alone in the still unfinished and dusty Kathleen, wedged under a berth installing the GHP&apos;s compass and taking notes about little hardware changes that would make that task easier for other professionals. 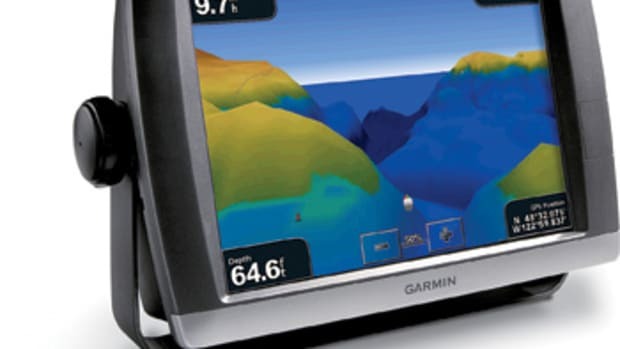 I remembered years ago when Garmin was mostly about smaller boats and "big boxes" and when I learned the value of asking companies about their competitors. 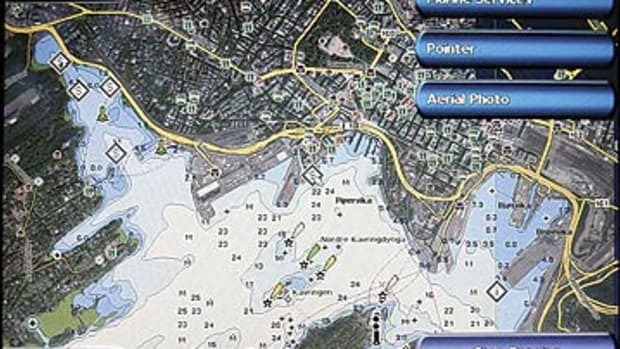 I&apos;d been surprised that most every big boat electronics company cited Garmin as its major worry. For years now I&apos;ve been learning why. This article originally appeared in the December 2008 issue of Power & Motoryacht magazine. © 2019 Cruz Bay Publishing Inc., an Active Interest Media company. All Rights Reserved.